Bring Your Group to Visit! We welcome school groups of all ages. The site can accommodate about 50 students at a time. If you have more than that, we split them into two groups and stagger them. You should bring the appropriate number of chaperons to help muster the groups and supervise. Upon arrival please have a representative register with the Center. Then the group is given an age appropriate, short introduction about fossils and how to hunt for fossils. They can look at our collections on display to see the possibilities! After orientation, they walk up to the site, which is 2 blocks away. Schedule at least an hour at the site. A staff member will accompany your group. When they are through digging, they bring their finds down to the Center for identification. 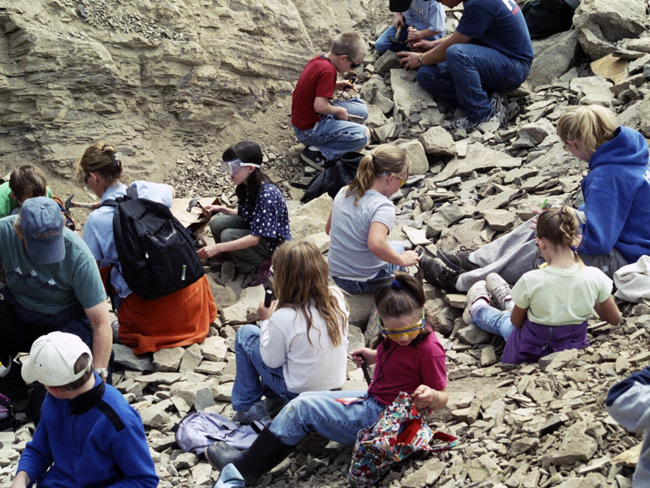 Fossil identification will take place in the park for large groups. Each child is allowed to keep 3 fossils (unless staff thinks it is of significant scientific value). The cost for school groups is only $2 per student. We do not charge for the adults chaperons, unless they wish to dig for fossils also. Tool rental (a rock hammer and chisel) is $3.00 per student. They may also wish to bring a few extra dollars for rock/fossil specimens or snacks and beverages that we have for sale in the Center. If you wish for us to invoice you, please let us know. We also take checks, Visa and Mastercard. The city park is directly across the street from the Center, and offers a covered table area and plenty of green lawn. Depending on your schedule, you can have your lunch there, before or after fossil hunting! If your group is large and requires us to stagger parts of the group, the group can vary their lunch times at the park. Please visit the rest of our website, www.stonerosefossil.org for other information about Stonerose. We look forward to hearing from you and having your group visit us! Students and teachers searching for fossils.